The Office CleanUP 5.0 is a software program to configure and repair Microsoft Office applications like Outlook, Word, Excel, Powerpoint, Access, Onenote, Infopath, Project, Publisher and Visio, if it needed. The program supports Microsoft Office 97 to 2016. Especially earlier Office versions, or mixed Office version installations, e.g. 2013 and 2016, is it possible that some functions leave the service. To solve the problem is often a uninstallation and new installation nessesary. This can be very lengthy and frustrating. With the Office CleanUP, it is possible to resolve most errors with one click. The Office CleanUP works easily and does not require in-depth knowledge of the individual Microsoft Office programs. 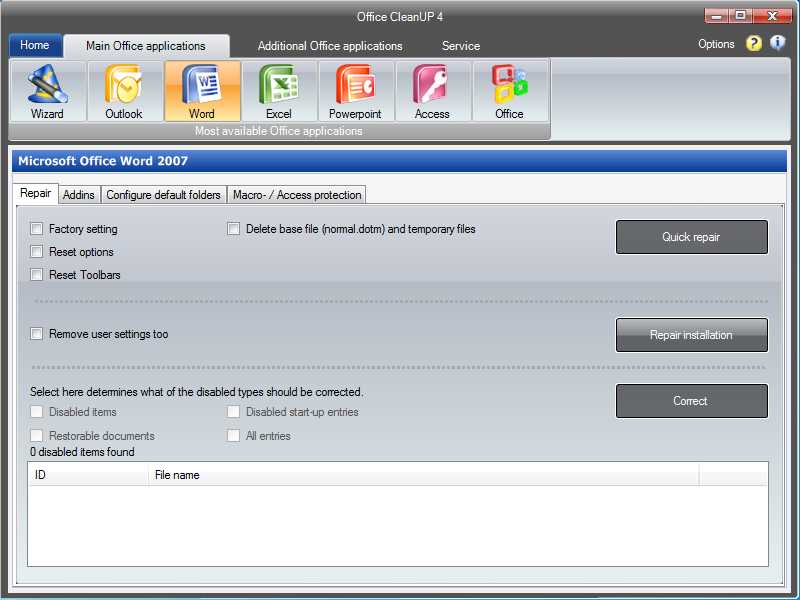 After starting is the repair wizard displayed and shows the installed Office programs. Activate the checkboxes to define, which Office program you want to repair. You can choose between two options, fast-repair and repair-installation. The execution of the first option should be tried first. This option solves often the problem. If that option wasn't successful, try the second repair method named repair installation. Download the Office CleanUP and try it 30 days for free. The application contains no restrictions during the test phase.